Waste-away natural aquarium cleaner helps keep your aquarium clean and water crystal clear using novel sludge busting beneficial bacteria that will naturally dissolve the sludge and dirt that accumulates in an aquarium and prevent the build-up of waste when used on a regular (weekly) basis. 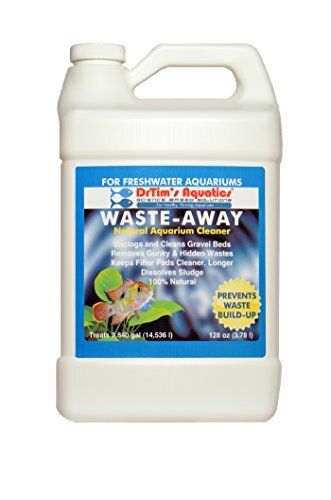 Waste-away is fast acting and specially formulated to remove aquarium gunk, unclog gravel/coral beds, and keep filter pads freely flowing longer. Waste-away reaches places in your tank you can't! this results in better water flow, more oxygen and a healthier aquarium environment. Waste-away removes dissolved and particulate organics, reduces nitrate and phosphate and is 100% natural. Contains no phosphate. For freshwater aquariums. 128 oz treats 3,840 gallons. If you have any questions about this product by DrTim's Aquatics, contact us by completing and submitting the form below. If you are looking for a specif part number, please include it with your message. Seachem Prime, 4 L/1 fl. gal.